Tonight the Pirates take on Nate McLouth and the Atlanta Braves. Last year McLouth was an all-star for the Bucs. Lets take a look at how other Bucco all-star outfielders did in their first game against the Pirates. Bobby Bonilla- Bobby Bo was an all-star with the Pirates from 1988-1991. In his first game against Pittsburgh, Bonilla went 0-4 with a strikeout in a game the Pirates won 7-2 over the Mets. Barry Bonds- Bonds was a Pirate all-star in 1990 and 1992. In his first game against his former team, Bonds was 2-4 with a triple, double and an RBI. The Pirates got 2 runs in the bottom of the 8th to beat the Giants 6-5. Andy Van Slyke- Slick was a three time all-star for the Pirates in 1988, 1992 and 93. In 1995 Van Slyke went to Baltimore as a free agent and then was traded to the Phillies. On 07/26/95 Van Slyke went 0-4 with a walk, a run scored and a strikeout in a game the Pirates lost 2-1 in 11 innings. The Pirates only had 2 hits. Brian Giles- Giles faced the Pirates for the first time since being traded on 05/19/2004. He went 3-4 with an RBI in the first game of a double header that the Padres won 6-3. 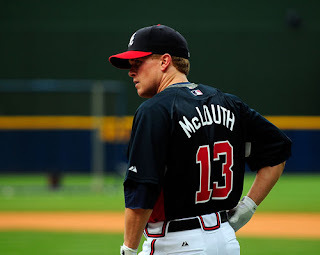 So what can we expect to see out of McLouth tonight? I'm guessing a lot of tears from the rest of the Pirates who wished they were the ones traded. In case you are wondering, Jason Bay has never faced Pittsburgh since last years trade.